There are some games for which rose-tinted glasses are not required. No matter how far back through the time tunnel you’re squinting, they still runneth over with quality. 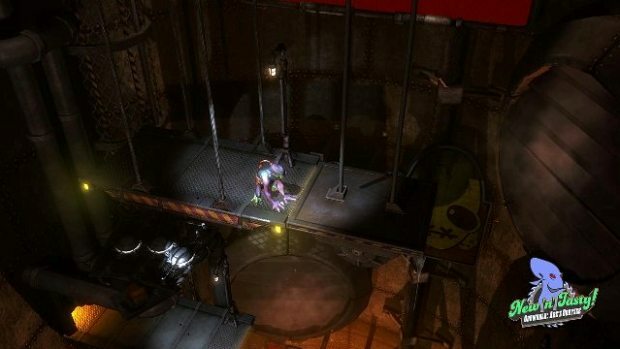 Oddworld Inhabitants’ Abe’s Oddysee is one such title, a classic puzzle platformer with added stealth elements and unique mechanics that put it firmly ahead of its time. The story is one of fate and heroism as you guide Abe in his attempt to escape the meat processing plant he works at, following his discovery that the meat his employers are putting into the innovative New ‘n’ Tasty recipe is harvested from the Mudokon workers. This realisation – and Abe’s subsequent mild-mannered rebellion – leads him towards his destiny as the Chosen One. Given the sterling work done by Just Add Water in re-skinning and updating the excellent Oddworld: Stranger’s Wrath, expectations were high for their reinvigoration of Abe’s first adventure, and it’s safe to say that those expectations have been exceeded. A game that didn’t have many faults to begin with is now close to flawless. Without going back and playing the original, it’s hard to pinpoint exactly what those faults were, but New ‘n’ Tasty presents such a polished package that it’s really quite unimportant now. The 2.5D world is highly detailed and beautifully rendered, brought up to date with the level of care and attention for which J.A.W are fast becoming known. Such is the competence of the port that newcomers would be forgiven for thinking New ‘n’ Tasty was an original game, but if anything betrays the old school roots it’s the difficulty. Levels consist of freeing Abe’s fellow Mudokons and solving environmental puzzles, and sharp difficulty spikes abound. Abe is squishy, see, and has very few defensive or offensive capabilities. As a result, the Slig guards and wild, viciousScrabs must be avoided at all costs – not to mention a gameworld that really, really wants Abe dead. New ‘n’ Tasty throws obstacles at you thick and fast, from motion trackers that will punish you with instant-death if you set them off, to deadly mines and falling boulders. Often timing is the key to success, but the death traps will lead unavoidably to an element of trial and error, facilitated by a fairly lenient checkpoint system. Creeping past a sleeping Slig is tense every time, and Abe’s ability to communicate via whistles, one-word inflections, and passing gas lead to some interesting interactions with NPCs. Despite Abe’s gentle disposition, he’s not entirely helpless. Being the chosen one grants certain benefits, like being able to open sacred bird portals through which his Mudokon allies can escape, and through which he can fast travel to other areas. Holding down L2 and R2 will activate the chant, which can also possess the bodies of unsuspecting Sligs, enabling Abe to execute or disorientate his enemies. You can also find a variety of projectiles, from rare grenades to enemy-distracting stones. If there’s a noticeable hangover from the original incarnation it’s in the platforming itself, which is still occasionally sluggish and imprecise. It’s a minor gripe, really, as the checkpoints are close and it’s only a real issue if you’re rushing – which is something you won’t often be called to do. The “one life each” co-op mode returns, and is one of the most grin-inducing nods to the game’s antique nature. 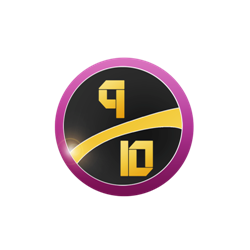 In a more modern twist, there are now leaderboards to satisfy all the die-hard competitors out there who simply must climb those ladders. 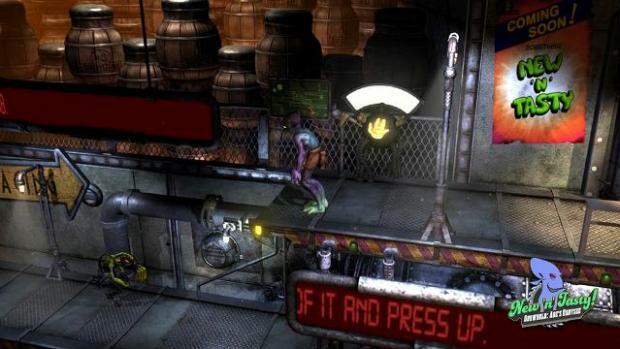 More than this though, it’s to facilitate speed-running, which New ‘n’ Tasty is practically built for. Of course, the graphical update is beautiful, presenting rich and varied environments that look like they’re part of a bigger world, and the sound design is largely untouched, retaining the same voice work and sound effects. The charm is palpable, seeping from New ‘n’ Tasty’s every pore, reminding us why we fell in love with Abe’s Oddysee in the first place. VERDICT: If anyone knows how to bring a classic onto modern stage, it’s Just Add Water. 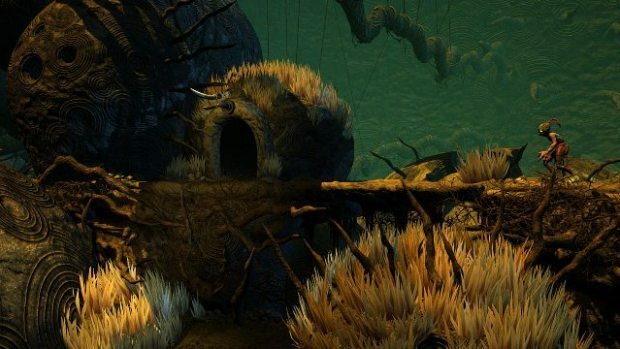 Not just an excellent port of a great title, but a solid game in its own right, Oddworld: New ‘n’ Tasty is fully able to proudly rub shoulders with any puzzle-platformer released in the last ten years.